Estampe provides a source for real savings on stock and custom Reynolds and Reynolds and ERA® auto and truck dealer forms used in fixed operations service departments. All custom forms are guaranteed to work with your Reynolds & Reynolds and ERA® dealer management system. If you wish to order custom Reynolds & Reynolds or ERA®, please call us at 1-866-348-6414 for a quote. ERA® is a registered trademark of The Reynolds and Reynolds Company. Estampe Auto Dealer Supplies has no affiliation with Reynolds & Reynolds® and any reference to ERA® on this web site is for compatibility and comparison purposes only. Originally designed for Chevy, Buick, and GMC dealerships - this Vehicle Inspection and Reconditioning form is designed to be used by expertly trained vehicle service technicians to insure all pre-owned vehicles sold by your dealership are of the highest quality. Provide this 172 point vehicle inspections form to your customer as proof that the used car they plan to purchase has passed the most expert, rigorous inspection standards. This form insures your customers that no major system has been overlooked, and that an expert mechanic has inspected everything from the drivetrain to the windshield wipers. This Certified Pre-Owned inspection form will help you close deals and increase sales. Grow your preventive maintenance sales with these vehicle inspection forms. This form is perfect for independent repair shops. It is 2-part carbonless, edge glued form with a full color front. These 3-part carbonless GM Multi-Point Vehicle Inspection Forms are available as the stock generic form shown above or imprinted with your business name. These 2-part carbonless Generic Multi Point Vehicle Inspection Forms are available as the stock generic form shown above or imprinted with your business name. These 2-part carbonless Honda Multi Point Vehicle Inspection Checklist are available as the stock generic form shown above or imprinted with your business name. These 3-part carbonless Chrysler Vehicle Checkup Forms are available as the stock generic form shown above or imprinted with your business name. This Generic Multi-Point Inspection Form - Express Lane - is a 3-part carbonless, snap-out form with white, canary, and pink parts. This Hyundai Multi-Point Inspection Form is a 3-part carbonless - edge glued (White, Canary, Blue). Part 1 (full color), Parts 2 & 3 (black ink). These 2-part carbonless Toyota Quality Vehicle Inspection Forms are available as the stock generic form shown above or imprinted with your business name. These 3-part carbonless Vehicle Check-Up Forms are available as the stock generic form shown or imprinted with your business name. These 2-part carbonless 27 Point Inspection Forms are available as the stock generic form shown above or customized to match your exact needs. These Multi-Point Inspection Forms for Mazda vehicles are a great way to improve customer satisfaction and generate additional work. These 2-part carbonless, edged glued - White Canary. Part 1 is full color and part 2 is black ink. These Multi-Point Inspection Forms for Nissan vehicles are a great way to improve customer satisfaction and generate additional work. These 3-part carbonless, edged glued - White, Canary and Pink. This Red Alert Vehicle Damage Inspection Form protects yourself and your customer. This form is 1-part, 20 lb white stock and prints in Red ink. This is a quick easy to use form that records all vehicle damage. Use this on every service write up. This Vehicle Check in Report is a great way to protect yourself from previous damage on a vehicle. Use this form to check in every vehicle. This Vehicle Get Ready Form includes detailed information about the vehicle and communications specific information for delivery of the vehicle, exactly as promised. Use this excellent Vehicle Inspection & Estimate Form to document the condition of your customer's vehicle during the initial walk-around. It allows you the point-out and mark any pre-existing damage or issues to the vehicle. It also allows you to provide an initial estimate of repairs in writing. This form will help protect your business against false claims of damage and communicate clearly to the customer the terms of your estimate. This Vehicle Inspection Worksheet is an excellent pre-service write-up with all the pertinent information and any vehicle damage reported. Has standard disclaimer and minimum diagnostic charge for customer to verify. This Pre-Service Check-In Sheet - sometimes called Pre-Service Repair Order or Auto Repair Check-In Sheet - is the perfect solution for long lines in the service lanes. Make sure your sales and service departments remain efficient and organized by using these Automotive Internal Authorization Books. These books will save your dealership time and money by documenting all communications between your Sales Department and the Get-Ready-Department. Using these Internal Authorization Books will also help improve customer satisfaction. These are the classic auto service dispatch numbers. This item goes by many names such as: hat numbers, spotter numbers, power numbers, auto service dispatch numbers, hat tags, job numbers, locators, tower numbers or service claim check tags. Looking for extra strong auto service dispatch numbers? 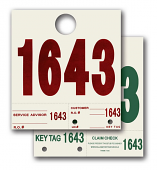 If your situation requires extra durable job numbers or service claim check tags, then these 125# heavy paper stock dispatch numbers should do the trick. Color Coded Service Dept ID Tags: New Colors Available - red, blue, green and yellow. These dispatch numbers allow you to color code your auto service jobs. They're great to use for customers waits, quick lube, team concepts and auto service adviser ID tags. This customizable Service Dispatch Tag is a great way to send a marketing message to your customer. For example, one very popular use for these is to promote CSI surveys. But there are numerous other great ideas such as promotional coupons, trade-in offers, thank you messages and many more. Please call us for help with design ideas.